The rivers of Washington on the Eastern coast of the United States runs through some of North America’s most dramatic scenery; the forests are home to diverse wildlife species, including the Bald Eagle, the rivers provide a fantastic spawning habitat for salmon. It is the only large river system in Washington that contains healthy populations of all five native salmon species & two species of trout. NaturesLens invites mid-level & experienced wildlife photographers to participate in a new photography holiday, which involves navigating the waterside territory around Concrete, Washington, by boat, to photograph the population of bald eagles that winter in the area. We have chosen this location carefully to present another opportunity for a fantastic bald eagle photography experience. The areas we will use on the Skagit River are home to nearly 1000 eagles as they feed on the abundant supply of spawning chum salmon. Throughout the duration of this photography holiday, you will be presented with many chances to capture images of the eagles in flight & in their environment, providing for you the opportunity to capture both wide-angle pictures & up-close. 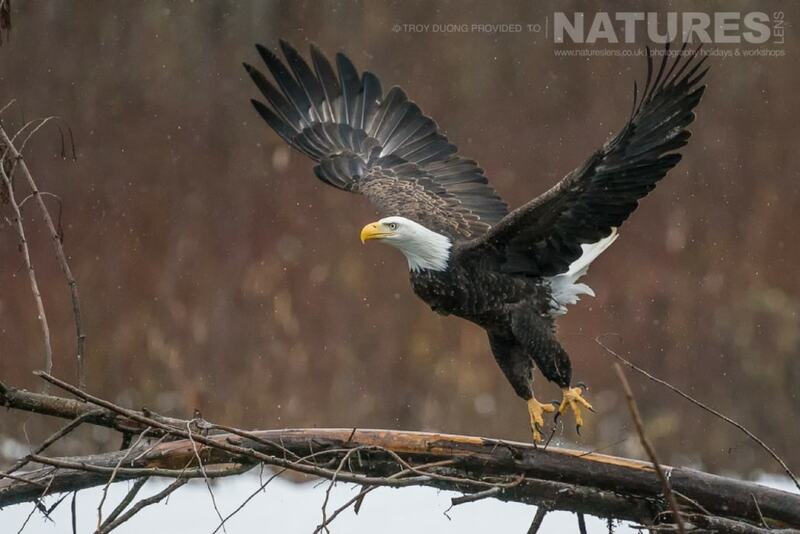 Join NaturesLens on a photography experience that offers opportunities to fill your photography portfolio with images of the bald eagle. Based in the town of Concrete, Skagit County, we will venture out every day on boats to capture stunning photographs of the bald eagle. The full details of this exciting trip are available here. This entry was posted in announcements, photography holidays, worldwide tours and tagged bald eagle, deer, elk, moose, photography holiday, trumpeter swan, winter. Whatever your query regarding our photography holiday, Photograph the Bald Eagles of the Pacific Northwest, please fill out your details below & we will get back to you.